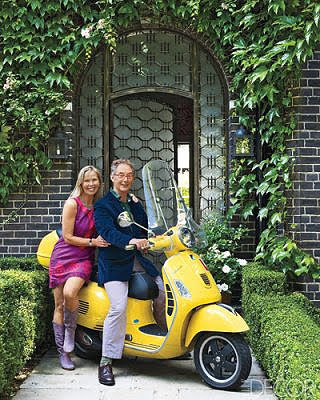 Coincidentally, the couple responsible for the Firmdale Hotels in my last post, feature in the latest Elle Decor. Kit and Tim Kemp own the new Crosby Street Hotel in New York as well as the Haymarket Hotel, Soho Hotel etc in London and this is their own house near Hyde Park. That's them on the scooter in front of their gorgeous front door. 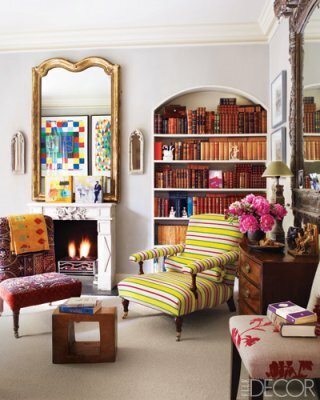 The striped rug in the loft, the wing chairs at the dining table and the bold prints used to upholster sofas are stand-out details. 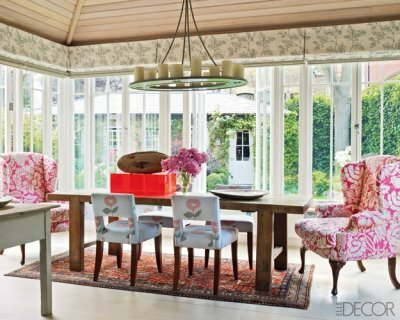 The wing chair upholstered in french tea towels in the kitchen is quirky and I just love it. They moved the kitchen (which is usually in the basement in these types of houses) up into one of the best rooms in the house which has proved a great success as Kit is a keen cook. The exuberance of Kit Kemp's approach to decorating is catching and I am looking forward to staying in one of her hotel bedrooms soon! 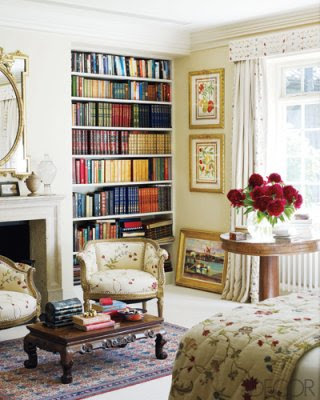 Some gorgeous furniture fabrics, love to see some fun punches of colour with furniture. 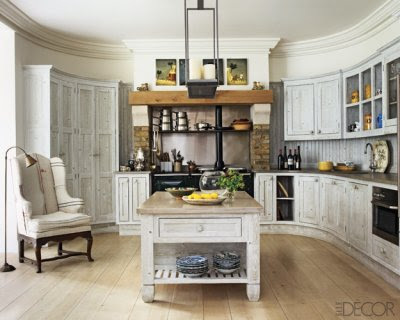 But the white shaby chic cabinet in the entrance hall is stunning I love it. i like the kitchen. great island bench. 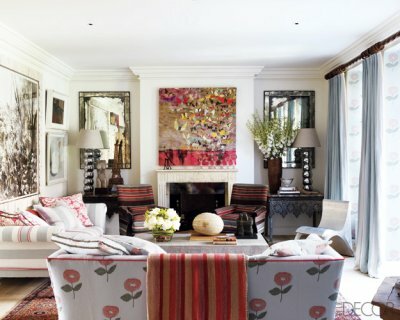 I love her work ~ always so eclectic and colourful, yet with a comfortable elegance about it all. Hey, I really love the first image. and the bookshelf! !